Received this clock kit on time, spent almost four hours to .. Received this clock kit on time, spent almost four hours to put it together and this clock works great and beautiful. This kit came with all components were clearly labeled and setting the clock is not so difficult to learn. I have ordered the RTC ki..
Soldering the surface mount components is as described (not for the inexperienced), but the result is well worth the effort. 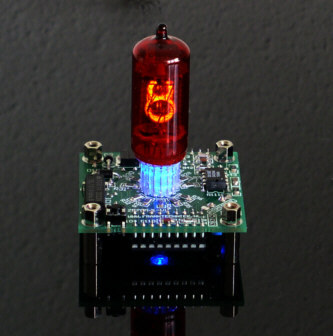 This is my 3rd nixie clock kit and already has gotten more comments than the others... (ps-my advice is: 1. work in a c.. I have two of these single digit clocks built now, and I just love them. Several people have asked that I build one for them, and no one has failed to comment once they have seen this beauty. They are easy to build, and facinating to watch once runni..